You are here: Home / About Farming & Food / What is Corned Beef? Corned beef is a classic dish for Saint Patrick’s Day. It also makes a delicious sandwich anytime! Have you ever wondered just exactly what is corned beef? Corned beef is a traditional meal for Saint Patrick’s Day. It’s also very popular in sandwiches on the East Coast, where I grew up. Simply put, corned beef is a large piece of beef that has been cured with a salt and spice rub or in a salt and spice brine. It needs to cure for a long time (usually longer than 7 days) for the cure to penetrate the entire thickness of the beef. When beef is cured this way, it usually turns a brown-gray color. To keep the classic red-pink color of corned beef, a preservative is added. The most common preservative is sodium nitrite (sometimes called pink curing salt). Most recipes for corned beef only use 2 teaspoons of sodium nitrite in 1 gallon of water, so there is only a small amount of nitrite present. Pink curing salt isn’t usually available at your local grocery store, but you can find it online. This Hoosier Hill Farm Prague Powder is what you need to make corned beef. Why is it Called Corned Beef? There is no corn used to make corned beef. In the original corned beef cures, very large chunks of salt were used. The salt was the size of kernels of corn. That’s why it’s called corned beef! What Kind of Beef is Corned Beef? Traditional corned beef is beef brisket. Brisket can be a tough cut of beef, so the curing and cooking process that is used to make corned beef is a good way to make this cut very tender and palatable. Beef round is also commonly used to make corned beef. Any cut of beef can be used for corned beef. 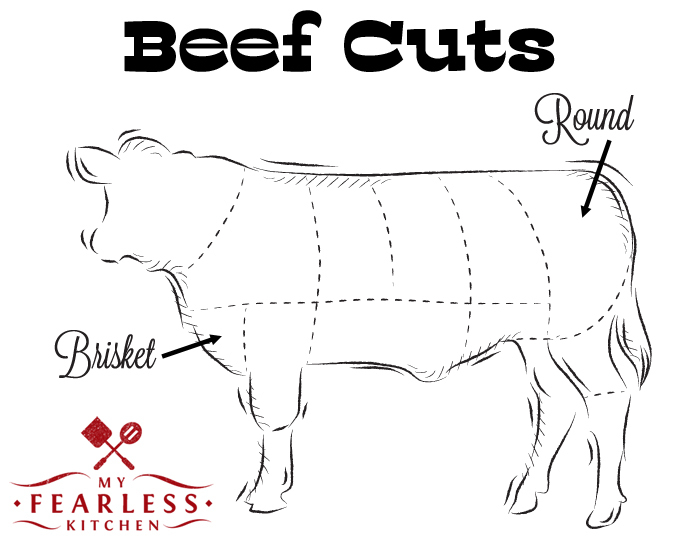 The best choice for corned beef is a cut that is likely to be a little tougher using classic cooking methods. How is Corned Beef Cooked? Once the beef is cured, it still needs to be cooked! Classic corned beef is gently simmered for a long time. A 4-5 pound corned beef brisket should be simmered in water for at least 3 hours (sometimes up to 7 hours). The longer the meat cooks, the more tender it will be. Cured brisket can also be smoked. The texture of the meat will be different when it is smoked than when it is boiled. During smoking, more of the moisture in the meat is lost. Beef brisket that has been cured and then smoked is pastrami. Can I Make Corned Beef At Home? Corned beef often goes on sale in the grocery stores before Saint Patrick’s Day. Other times of the year, corned beef can be quite expensive, or very hard to find. Beef brisket is usually a budget-friendly cut. If you can brine a turkey or a chicken, you can make corned beef! All you need is a container large enough to hold the brisket (I like 2.5-gallon Hefty bags), refrigerator space, and a pot large enough to cook the brisket in (this one works up to a 5-pound brisket). Here is our favorite recipe to make corned beef at home. Have you had corned beef before? What’s your favorite way to eat it? What’s the Difference Between Beef & Pork Ribs? What is the Best Meat to Grill? Hi, I have been working on the perfect corned beef recipe too. I am in the UK so brisket isn’t that common really but I have been using topside which in the US I think is called the round. I am getting very good results with cure #1 salt. The process is very similar to making bacon. Thanks for your question, Dee! I suppose it would be possible to have an upset stomach from one of the ingredients in the pickling spice or pickling salt (preservative) that is used to make corned beef. The pickling spice I used has cinnamon, allspice, mustard seed, coriander, bay leaves, ginger, chilis, cloves, pepper, mace, and cardamom. The pickling salt I used is sodium nitrite. Different companies have different pickling spice blends that they use. It takes 7-10 days to make corned beef, so I would definitely recommend figuring out if you can eat it before you invest that kind of time in a large brisket! Good luck.